The apostle John was given a great prophetic revelation of a woman riding a great scarlet beast, and the judgment which would befall her for her wickedness. Who is prophetic “Babylon the Great” of the Bible? She is already in the world today. So it is a subject of vital importance to understand, because the hour of this prophecy’s fulfillment is unfolding before our eyes. Looking at the vision shown to John, we will let all the Bible speak for itself to expose the identity of this woman. Here are brought to our attention four things: a great whore; she is enthroned upon the waters; she commits fornication with the kings of the earth; the inhabitants of the earth are intoxicated by this fornication. Now, we are told she is seated upon a great red beast, with seven heads and ten horns. We see the same picture of this beast in Revelation 12:3 as identified as a “great red dragon, having seven heads, and ten horns, an seven crowns upon his heads.” Evidently, the dragon beast gives this harlot woman her “seat, power, and great authority” (compare Rev. 13:2) to make the inhabitants of the earth drunk. But who is this harlot woman, and who is the dragon she sits upon? This is signified (sign- See Rev. 1:1) language, therefore it cannot be a literal dragon beast, nor a literal harlot woman. 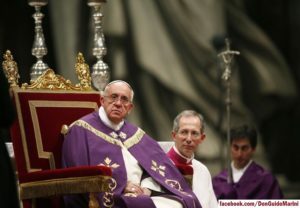 A seat in Scripture signifies a throne (See 2 Thes. 2:4; Rev. 3:21). A beast is also primarily symbolic of a kingdom and it’s representative king (See Dan. 7:17, 23). There can be no doubt that this woman is seated on the throne of the kingdoms of this earth by reason of her fornication with the kings of the earth. So we will open up this symbolism, that we may know for certain what they mean. We are told this woman is called “Babylon the great”. 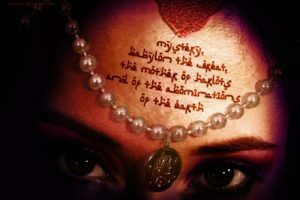 Who was Babylon? The Scriptures declare Babylon to be a unifier of apostasy and rebellion against God. When the Tower of Babylon (better known as Babel) was made, a confederacy of all the people of the earth was made against the Word of God. From this Babel, which means in the Hebrew language “confusion”, God judged the powers of rebellion by scattering their tongues. From this came the many diverse religions of the world, “the abominations of the earth”. The next time the Scripture introduces us to Babylon, it was taking captive the people of God into her gates because of the God’s people fell away into Babylonian apostasy, worshipping the gods of Babylon. When the appointed time came, spoken by the mouth of the prophet, the people were called to come out of Babylon and to reestablish the purity of their worship to the true God by coming out of the heathen sun-worship practices of Babylon, and the carnal comforts of it’s gates. Yet Babylon was destroyed, and was prophesied never to be rebuilt (See Isaiah 13:19-20). Therefore, it cannot be literal Babylon that is here spoken of. Therefore it must be the characeristics of Babylon; unity in rebellion, apostasy from the truth, the taking captive of the people of God, and the need for deliverance out of Babylon at the hour of her judgment. 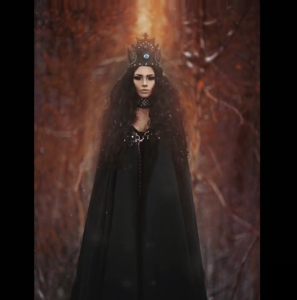 What is a woman in Bible prophecy? “I have likened the daughter of Zion to a comely and delicate woman.” (Jeremiah 6:2) God’s people are likened to a woman all throughout Scripture (Also see Eph. 5:24-25). While a woman can signify a nation (See Gal. 4:25-26), it also signifies the church (which is the people-Rom. 16:5) of that nation. When the children of God began to worship the gods of the heathen nations around them, He declared: “…thou have played the harlot with many lovers; yet return again to me, saith the LORD…thou have a harlot woman’s forehead, you refused to be ashamed.” (Jer. 3:1,3) He further testifies through Isaiah: “How is the faithful city become an harlot! it was full of judgment; righteousness lodged in it; but now murderers.” (Isaiah 1:21) When the church becomes corrupt, the Scriptures declare it a harlot. Through the prophet Ezekiel, the Lord declared judgment upon Israel and Judah as committing fornication with the surrounding nations had declared upon them the same name of unfaithfulness, with the same judgments which come upon the harlot of John’s vision. Thus we can rightly conclude that John is seeing an unfaithful church, full of the sins and works of ancient Babylon. We are now going to take pains to clearly show that the church which claims to be the “mother church” of all the Protestant churches, the Catholic church, is the very “mother of harlots” here identified in unmistakeable measure. “And the woman was arrayed in purple and scarlet colour, and decked with gold and precious stones and pearls, having a golden cup in her hand full of abominations and filthiness of her fornication…” (Rev. 17:4) These colours and the golden cup would be even more identifiable with the ancient church of Israel. Yet one color is missing. It is the color blue, yet this signifies something very important regarding this priesthood. “Speak unto the children of Israel, and bid them that they make them fringes in the borders of their garments… and that they put upon the fringe of the borders a ribband of blue:…that ye may look upon it, and remember all the commandments of the LORD, and do them; and that ye seek not after your own heart and your own eyes, after which ye use to go a whoring: That ye may remember, and do all my commandments, and be holy unto your God.” (Numbers 15:38-40) The color blue on the priesthood was to symbolize his faithfulness to the commandments of God; he was not to “go a whoring”, playing the harlot, by breaking the law of God. Thus, this is a church and priesthood which has forgotten the commandments of God, and do not “remember” them. The golden cup was also a vessel of the sanctuary of God, used by the priesthood. In the holy cup nothing of fermentation was to touch it; but only a pure drink offering of the fruit of the vine; also called unfermented “wine”. The priesthood was specifically instructed on this point: to be sober for their holy duties. “Do not drink wine nor strong drink, thou, nor thy sons with thee, when ye go into the tabernacle of the congregation, lest ye die…: And that ye may put difference between holy and unholy, and between unclean and clean; And that ye may teach the children of Israel all the statutes which the LORD hath spoken unto them by the hand of Moses.” (Leviticus 10:9-11) The priests were not to use the holy golden cups of the tabernacle to drink that which would distort the judgment, and destroy discernment between the holy and unholy. But we see that this church is not only drunk herself, but is intoxicating all the inhabitants of the earth through her sins. Thus, her drink is the filthiness of fornication and abominations where she has sinned against God, and is making man to forget God, and His holy commandments under the appearance of a holy priesthood. We see this golden cup used in Babylon in the book of Daniel 5, at the judgment. 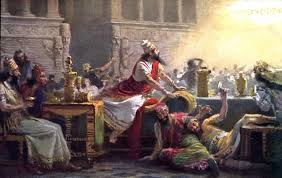 “Belshazzar, whiles he tasted the wine, commanded to bring the golden and silver vessels which his father Nebuchadnezzar had taken out of the temple which was in Jerusalem; that the king, and his princes, his wives, and his concubines, might drink therein. Then they brought the golden vessels that were taken out of the temple of the house of God which was at Jerusalem… [And] They drank wine, and praised the gods of gold, and of silver, of brass, of iron, of wood, and of stone.” (Daniel 5:2-4) The king of Babylon held an idolatrous pagan feast and used the holy cups of the priesthood. Yet how much worse is it when the king of Babylon is dressed in appearance as a priest of God to deceive the people, confusing them to choose the unholy with the holy and the unclean with the clean! It was after this scene in the courts of Babylon, that the Finger of God appeared to write the judgment of God against Babylon for taking holy things and using them in an unholy manner, taking them upon unholy lips. This Finger of God was the same that wrote the commandments of God on tables of Stone. 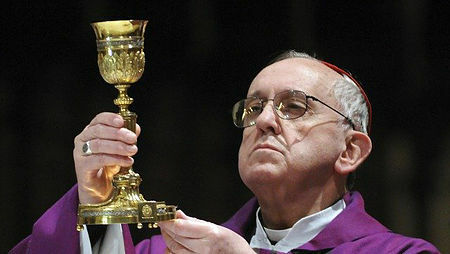 Thus the wine of the golden cup represents the false doctrines and traditions of man, unholy, unclean, that have been adopted by the church from pagan Babylonian sun-worship, which have affected the entire world. This communion cup is not the pure unfermented wine of Christ’s communion, representing His blood. An amazing fact is that pure unfermented wine actually cleanses the blood of those who drink it. But fermented wine pollutes the blood, causing intoxication when it passes the blood-brain barriers, and kills oxygen-carrying red blood cells. Independent.co.uk writes: “From the first sip, alcohol is absorbed into the bloodstream and reaches the brain. Although you won’t be aware of it, there is an impairment of brain function, which deteriorates further the more you drink. Cognitive abilities that are acquired later in life, such as conduct and behaviour, are the first to go. Early on you will experience mild euphoria and loss of inhibition, as alcohol impairs regions of the brain controlling behaviour and emotion. Most vulnerable are the brain cells associated with memory, attention, sleep and coordination.” Thus, this communion cup held by the mother church of harlotry, the Catholic church, to forget God’s law. Her daughters, the Protestant churches, will continue to further this work, so long as they push forward the doctrines she has taken up from sun worshipping religions from Babel’s scattered pagan legacy (Sunday sacredness, Christmas, Easter, natural immortality of the soul, etc.). The tendency for the mother churches and the daughters to seek for communion together is a great sign of the times. “And I saw the woman drunken with the blood of the saints, and with the blood of the martyrs of Jesus: and when I saw her, I wondered with great admiration.” (Revelation 17:6) The filthiness of the cup of her fornication is more than taking up sacred professions of the priesthood at idolatrous pagan feasts, drinking false doctrine. But she is made drunk with the blood of the saints, “who keep the commandments of God and the faith of Jesus.” (Rev. 14:12). Her fornication is not merely departing from the precepts of the law of God, and of His worship, preferring the pagan practices of Babylon, but her guilt extends further. As Satan promised all the kingdoms of the earth to Christ if He would fall to worship him, Satan offers the same enticements to the church. Where Christ overcame however, the church has fallen. Satan lures the church into covering his deceptions with a garb of sanctity, and then establishes it on the pinnacle of the throne of the earth; having kings and governors bow down to this false definition of Christianity enforcing it by church/state union. The Catholic church, the harlot of Revelation, commits fornication with the kings of the earth. 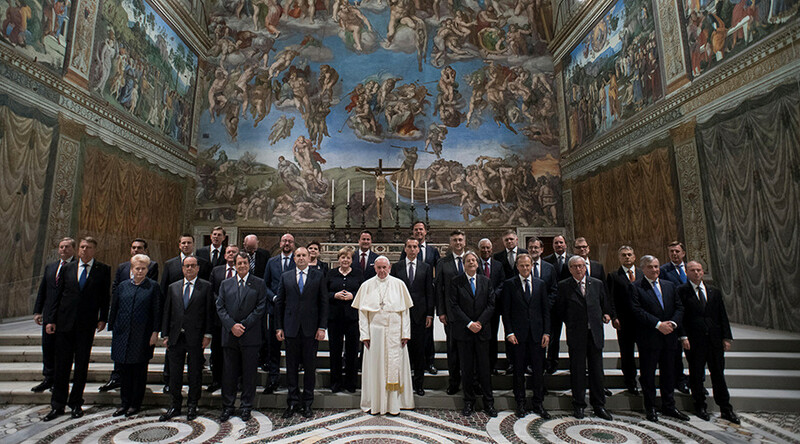 They ruled over the kings of Europe for centuries, even as the harlot “reigneth over the kings of the earth.” (Rev. 17:18) It has been done, it stands as a witness in the truest historians recounting of history, and it has a blood-stained record of over 1000 years during the dark ages! By her unlawful union with the kings of the earth, this apostate church has forced the world to drink the cup of intoxicating doctrine. By this, false Christianity which is Catholic Christianity, was made to appear as the only genuine and true faith. Any who dissented from the teachings of the bishops and priests of the church were punished, severely tortured, and put to death. It is estimated by some historians that upwards to 50,000,000 Christians during the dark ages were massacred. Bibles were burned, and those copies that were available were translated into the dead-language of Latin so it was inaccessible to the public. The Protestant churches arose by the desire to turn back to God in the reformation back to the truths of the Scripture. Yet these churches, going not far enough, not digging deep enough into the Scriptures, often left many pagan vestiges of Babylon within their gates, and sought to justify them with little-to-no Scriptures. Thankfully the Bible unveils this deception of the enemy, that we may not believe that every article of professed Christianity is truly pure Christianity according to the Scriptures. By this, we may know that these deceptions have found their way into the churches, and to understand that Babylon the great, in connection with her daughters, is rising again. 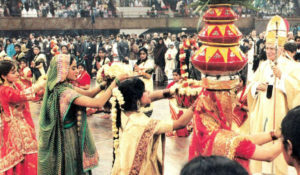 Shiva Worshippers honor Pope, to have priestess of Shiva to anoint him for an Indian blessing. 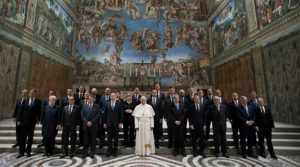 He is in unlawful connection with the kings of the earth; seeking position and favor and influence with them that was lost at the end of the dark ages through both secular athiesm and Biblical enlightenment. She, through the church’s representative, the Pope, addresses the United Nations. Has European Parliament members seeking her counsel, aid, and guidance. Has in recent years spoken to the great legislative bodies of the most powerful nations on earth. She wins influence as Babel’s old rebellion, by appealing to the pagans to pray with them for world peace, and to look for common causes. 1) Woman represents church. 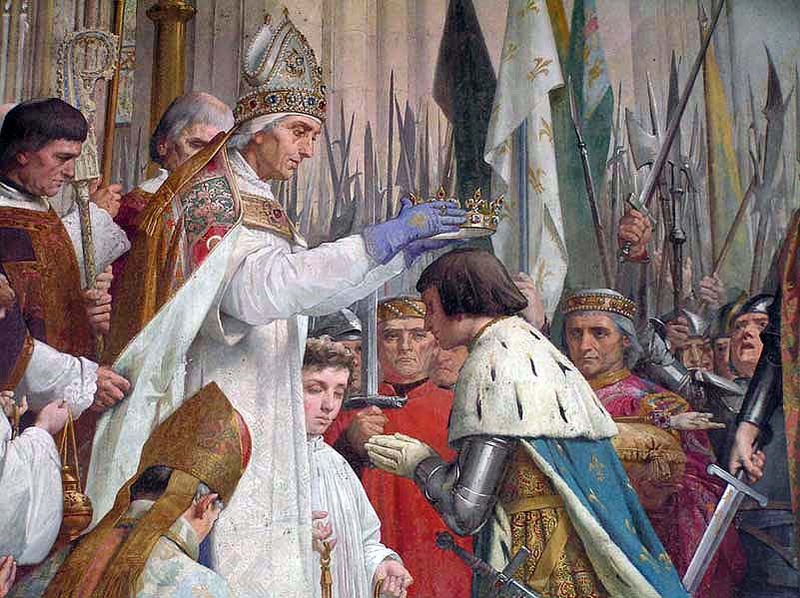 Catholic church united with kings of the earth. 2) Babylon took God’s people captive by force. Catholic Church took God’s people captive by force, using state power. 3) All colours of priesthood possessing, save the blue, representing remembering the law of God. Pope claims to change law of the Sabbath, which says to “remember”, for the sanctification of the pagan sun-day. 4) Idolatrous feasts of Babylon celebrated with sanctuary golden cups. Pagan sun-worship Catholic feasts honored with so-called Christian communion service. False doctrine under guise of Christian worship. 5) Tower of Babel was the place where all pagan worship and rebellion began. Catholics embraced pagan worship, and continues rebellion to Word of God. 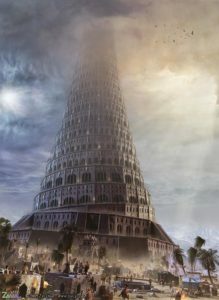 6) Tower of Babel made the people one in rebellion. Catholics use ecumenical prayer and interfaith services to make the pagans one with them, as ancient Babylon did.